January 23, 2012 – Last Tuesday, Syrian forces reduced the deserters in Zabadani to a woefully unimpressive number. But because of the Arab League foreign ministers meeting in Cairo, General Al-Dabi, who heads the observers mission, asked the Syrian Defense Ministry to consider a pull-out of tanks from the town as a show of good faith and as a slap on the back for the work of the Arab League observers. Syrian Deputy Chief of Staff, Lt. Gen. Assef Shawkat, apparently thought that was a good idea and witnesses reported a withdrawal of heavy armor. This outcome should not cause anyone to doubt that the Syrian armed forces can reduce Zabadani to dust along with its gangs of defectors. I believe that after the ridiculous vote by the Arab League to issue a demand that Dr. Assad resign in favor of his vice president, the tanks are going back one last time to finish the job. They will be accompanied by special forces to insure a swift and economical mop-up. WE, AT SYRIAN PERSPECTIVE, ARE GROWING TIRED OF DR. ASSAD’S EFFORTS TO PROJECT AN IMAGE OF REFINEMENT AND SELF-CONFIDENCE. THOSE OF US WHO SUPPORT HIM WANT TO SEE SYRIA TAKING THE OFFENSIVE. Frankly, attacks on Syria such as the one that destroyed the facility at Al-Kibar; or the over-flight of his home in Latakia; or the attack against the former PFLP-GC training base near the Golan, have soured us on refinement. We want to see Syria using its military capabilities to demonstrate to the population that there is a lion indeed in the Presidential Palace. Today, we know that NATO is surreptitiously training insurgents in the Province of Hatay. We know that the ugly, bloated hog prince of Catarrh is financing the transport of Libyan savages to join the so-called Free Syrian Army led by that yokel from Idlib. The need to bring in Libyans is proof positive that the number of deserters is much smaller than the Western media are promoting. We know that weapons are being shipped in to Turkey with the assent of the authorities in Ankara. But, Dr. Assad is doing what Saddam did: he is watching the enemy mass and organize right under his nose. This is not good military strategy and we are surprised that the Russians have not taken steps to encourage an appropriate Syrian response. In truth, we no longer know what a Syrian response is. It is possible that both Iran and Russian believe that time is on Dr. Assad’s side. Iran needs time to complete an important phase in its internal evolution; what that is remains a mystery. If it’s a nuclear breakout capability, then so be it. Russia on the other hand is waiting for something else which might be even more mysterious. SyrPer has information that the Syrian armed forces, for example, have received a type of technology heretofore unseen in the region and it is possible that the absorption of this technology is delaying a response. We are not at liberty to reveal the subject of this or the source. We know also that Syria has not begun to arm the PKK yet. Russian planners have warned that such action might trigger a foolish response from the Turks who are anxious to please their new Arabian ape-like sponsors. The Turks, as we wrote before, have a need to control the off-shore natural gas reservoirs near Cyprus and Lebanon. The Turks have been told by Muslim Brotherhood pimp, Burhan Ghalioun, that once a new government is installed in Damascus, the Russians will have to pull their fleet out leaving the gas-rich area open for Turkish exploitation and eventual entry into the European Union. But Syria has so many targets – soft and painful. 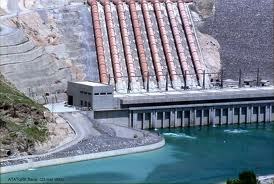 Like this one, the Ataturk Dam which is just waiting for one of Syria’s locally manufactured Scud-B missiles. In any case, the Persian Gulf is becoming quite a cynosure of interest what with an American carrier, a British frigate and a French warship having gone through the Strait of Hormuz. Allowing your enemy to gather around you and organize is not good. This is especially so when the enemy is openly trying to destroy you.